Want to Lose Body Fat? So, what is the real difference when we lose weight versus when we lose Body Fat? Many of us are familiar with the term BMI. What about our Body Fat compared to our muscle? After all, when we lose body fat, we become leaner, thin and in shape. For those of you who have never heard the term BMI, which stands for Body Mass Index, it is simply just a math term which is outdated and has the understanding what your ideal healthy weight should be based on your height. Well in reality, to shrink, you have to lose more than weight. Your body needs to lose body fat. Based on your BMI you could see if you are currently at your ideal weight, underweight, overweight or obese. Needless to say, using only two factors to determine if you’re healthy or not was deceiving to many. Overall, more updated and accurate weight loss tools should be used to offer real results which can guide you to getting results you want. Lets take a look at why this is so important. Well, what if you are an athlete? Imagine you weigh 156 pounds and are 5’3″. That would put you in the overweight category on the BMI chart. Pretty simple right? Now, let’s say being that weight, you were only 21% body fat and are wearing size 6 pants. Does that sound like an overweight person to you? No, not at all. Hence the reason for the need for a new method and methodology for determining what an individual’s true healthy body weight should be. Introducing Body Composition. The way to determine when you lose Body fat and not muscle. Body Composition still uses weight and height, but digs deeper to separate lean mass from actual body fat. A Medically Supervised Weight Loss Clinic will want you to lose Body Fat, not muscle. 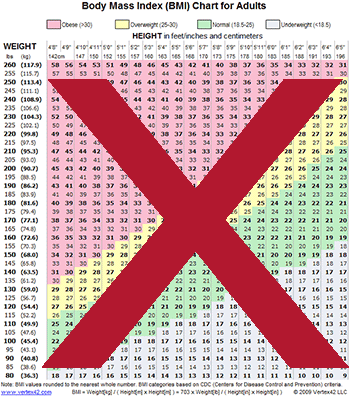 Typical BMI Chart – Found in your doctor’s office or by a simple internet search. What areas do you need to lose body fat? How much water are you retaining? What ways can we protect your lean mass while turning your body into a body fat burning machine? How can you lose more body fat? 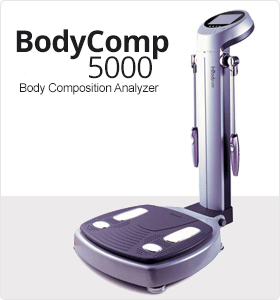 At MedShape Weight Loss Clinics we use a state of the art Body Composition machine called the BodyComp 5000. This non-intrusive device is exclusive to MedShape Weight Loss Clinics. Also this tool provides us the necessary insight to personalize a weight loss treatment plan based on the current composition of your body. Therefore, when it comes to losing weight, one size does not fit all. Everyone is different and this revolutionary device helps our medical team assist us in achieving the results you want. This machine will help MedShape’s Weight Loss Counselors determine how much protein is needed to keep your lean mass. Also based on your metabolic rate. It also tells us what your personal proper caloric intake should be in order for you to lose body fat and not hurt your lean mass. Furthermore, our goal is to be leaner, smaller and healthier with a better body composition. In conclusion, when we lose body fat and not muscle, we are lean, trim and receive the desired change in our bodies that we are looking for! It is more than a number on the scale. It tells us what is truly going on inside your body. Where are you storing your body fat and why. Want to learn more about the BodyComp 5000? View our BodyComp 5000 flyer. What can a body composition scan provide you with? 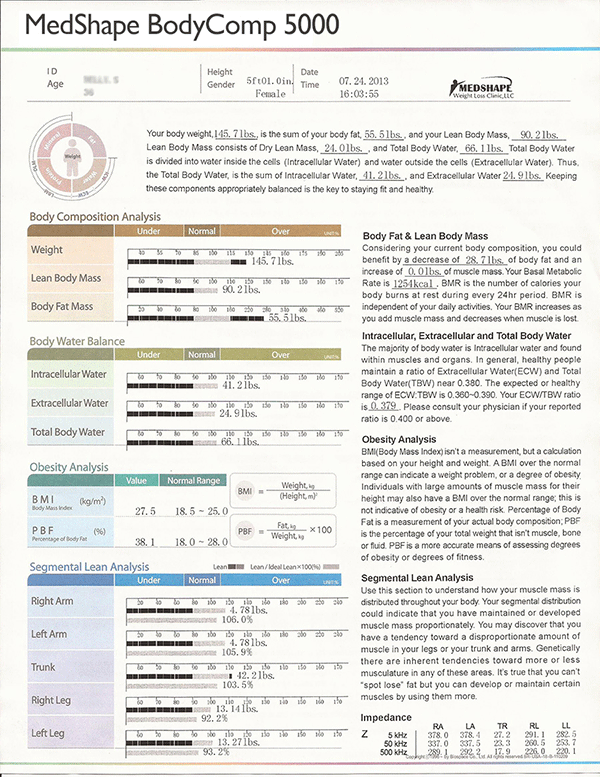 View the results of a body composition scan.